Vapor barriers are a way to protect your crawl space from different problems. Typically, a vapor barrier is made from heavy plastic. The plastic is used to cover the floor of your crawl space completely with overlap of at least six inches. The goal of vapor barriers is to protect your crawl space and home from different problems that can naturally occur. Unfortunately, many people don’t even think about needing them until it’s already too late. Read this to help you decide if you need a local Bay Area crawl space cleaning and attic cleaning company. There are a number of problems that can arise if you don’t have vapor barriers in your home. Many times, people don’t install vapor barriers until they already have one or more of these problems. But if you know what could happen in your crawl space without barriers, you’ll understand why it’s better to be proactive about installing them. The air in your crawl space can have a big impact on the air in the rest of your home. That means that if your crawl space isn’t protected by vapor barriers, the mold, mildew, and odors will seep into the rest of your home. This is an especially important issue for people who have allergies and sensitivities to molds and mildew. A Concord attic cleaning company can inspect your home for these damages. If you don’t protect your crawl space from natural moisture in the air, especially due to heavy rains, you run the risk of moisture getting into the wood in your home. That can lead to warping of your floors and other wood in the structure, even weakening support beams that can lead to sagging or unstable floors. 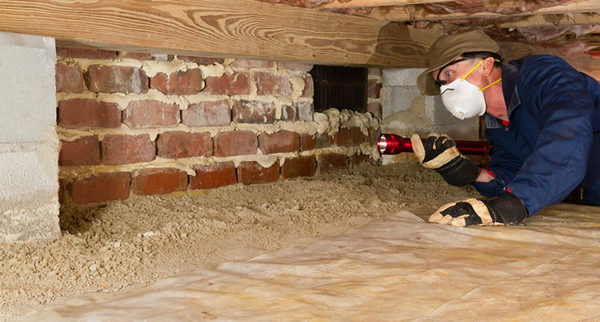 Without protecting your crawl space from moisture, your crawl space becomes very attractive to insects and other pests. Pests use the soft, rotting wood to make their homes and damage the wood even more than it already is. That can cause problems in the stability of your floor and run the risk of the pests spreading to the rest of your home. If you don’t protect your crawl space from moisture with vapor barriers, the wood supporting your home is at risk for mold and rot, which brings up odors. The smell can permeate the rest of your home. That’s unpleasant, but it’s a sign of a bigger problem. If your wood is rotting and moldy, there’s a risk that your floor will become unstable and the rot can spread further in your home. Winter can be a dangerous time for your pipes. If you don’t use vapor barriers to minimize moisture in your crawlspace, the moisture can collect on your pipes and you run a greater risk of frozen or burst pipes in your home. Don’t wait until you have problems to install vapor barriers. Contact us HERE to protect your crawl space and the rest of your home. Our specialists can help you protect your home for the future!